Anthony Pass is the Director for Athletic Training. 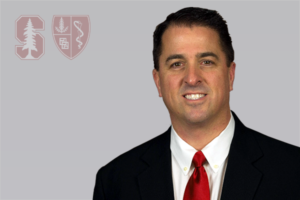 He has extensive experience in collegiate sports medicine management and clinical care. Pass strives to improve performance based health care, and is an advocate for the collegiate student athletes’ wellness. In his role he supervises the athletic training staff in directing health care for the 36 sports at Stanford University. From 2014-2019 he served as the University of Texas Assistant Athletic Director for Sports Medicine, Head Football Athletic Trainer. He was responsible for managing all the healthcare needs of the Longhorn football team. Pass supervised a staff of four certified/licensed athletic trainers in the Moncrief-Neuhaus Athletic Center. He also served, from 2016 thru 2019, on the University of Texas’ Staff Council as a representative for intercollegiate athletics. Pass was appointed in 2018 to the National Athletic Trainers’ Association Intercollegiate Council for Sports Medicine as the Big 12 representative. In 2013, Pass served as the head football athletic trainer for Texas Tech University. He spent the previous eight years at the University of Florida, first as the head football athletic trainer, then as Associate Director of Sports Health. While at Florida he served as a faculty member for University of Florida’s Primary Care Sports Medicine fellowship. In 2009 Pass was appointed by then-Florida Governor Charlie Cryst to the Florida State Board of Athletic Training, where he served until 2013. Prior to his stint at Florida, Pass was the head football athletic trainer at Indiana State University from 2003 to 2005. He spent 2002 working for the Houston Texans as an assistant athletic trainer and assistant strength coach, and was a season-long athletic training intern for the Buffalo Bills in 2001. Pass has served as an approved preceptor for the University of Texas, and the University of Florida undergraduate athletic training education program. An active member of the National Athletic Training Association, Pass has presented to his peers at numerous conferences and symposiums, and is a published author in various professional medical journals. A native of Broomfield, CO, Pass earned his undergraduate degree in Kinesiology from the University of Colorado in 1999 and later his master’s in Sports Administration from the University of Houston in 2001. He and his wife Gena have two sons, Anthony Jr. (AJ), and Noah.